In Chicago and the surrounding suburbs there is over 65 million square feet of ceiling tiles and the question is whether or not to paint or replace your ceiling tiles, Aardvark Painting has the answer and the easiest way to brighten a worn, unproductive work space is to repaint old, stained and discolored acoustical ceiling tiles. A complete replacement with labor and disposal of old material can get expensive. 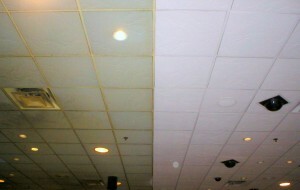 Therefore, recoating your existing ceiling tiles may be a more cost effective option. Whether as part of an office renovation or just a part of your regular maintenance cycle, acoustical tile restoration is a quick and economical way to clean up your work space. Our ceiling tile installers in Chicago will supply, cut and install exact or like-matched replacements for broken or missing tiles. Regular paint will fill the pores and make the tiles stick to the ceiling grid on your Acoustical ceiling tiles therefore voiding its sound dampening qualities. Aardvark Painting is an authorized Chicago Painting contractor that can apply ProCoat, a specialty product made for Painting acoustical ceiling tiles in Chicago. Unlike paint this coating provides a non-bridging, clean and bright finish while improving both acoustical and fire rating performance with out warping ceiling tiles like regular paint does. Aardvark Painting offers you a complete acoustical ceiling recoating or replacement service that can be completed overnight with little or no distraction to your daily routine. We offer a complete painting and interor finish services designed for the active facility manager. Our lobby and hallway Painting services address the needs of building and office managers for fast track job that need to get done right away. Call Aardvark Painting for a quick response and reliable follow-up with answers you can count on. Over the years of service we have built a quailified team and solid operational systems that assure on-time performance for your next painting project in Chicago.